We are on the North side of Main between 9th and 11th Streets in the Plaza on Main shopping center by Cancun Restaurant, Subway, Samarai Sushi, and Corral Family Restaurant. Call us at (760) 881-4025 for more directions if you need help finding us. A. Tops and Bobbins is open Tuesday - Saturday, 10:00am - 5:00pm. Q. What is a Bobbin Bundle? A. A Bobbin Bundle is a beautifully wrapped bundle of 8 coordinating fat quarters that includes a complimentary pre-wound bobbin of MasterPiece thread by Superior Threads. Q. Do you offer longarm quilting services? A.Yes, we have two computerized quilting machine with thousands of patterns to choose from and a quick turnaround time. We also offer an assortment of batting from Quilter's Dream if you would like us to supply the batting for your quilt. Q. How do I get a quote for Longarm quilting? A. Just give us a call, send us an e-mail, or come to the Shoppe! Q. How do I prepare my quilt top for Longarm quilting? The top, backing, and batting of your quilt should not be basted together. Each layer will be loaded onto the quilting frame separately. Make sure your backing and batting are 6-8 inches longer and wider than your quilt top. Press your quilt top and backing and make sure seams are lying flat. Trim all loose threads from your seam allowances. If your quilt top (or backing) is directional, please indicate which side is the top of your quilt. PLEASE make sure any borders are applied correctly! Wavy or crooked borders can detract from the beauty of a carefully pieced quilt top. Extra fullness will not "quilt out" and there may be tucks in the quilting. To help prevent problems, measure the length and width of your quilt top before cutting and sewing on your borders. 1. Measure across each side of your top and down the center. 2. Add these three numbers together. 3. Divide this number by 3. This is the length of your side borders. 4. Cut to length, pin (easing in any fullness), and sew. The sides of my quilt top measure 65” on the right, 65 ½” on the left and 66” down the center. I add these numbers together and come up with 196 ½”. When I divide this number by 3, I get 65 ½”. This is the length I need to cut my side borders. After pinning, sewing, and pressing my side borders I need to repeat the process to determine the size needed for my top and bottom borders. Including the side borders I just applied, my top measures 56” across the top, 55 ½” across the bottom and 56” across the center. I add these numbers together and get 167 ½”. When I divide this number by 3, I get 55.8333”. 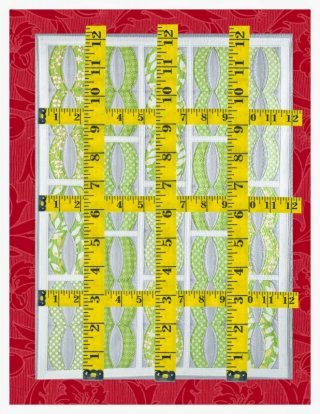 This is a little confusing but I can see by comparing my numbers that the length I need to cut my top and bottom borders is rounding up to 56”. Cut it, pin it, sew it and press it. Congratulations! Your top is finished and ready for your longarmer! Q. How do I make a pieced backing? For larger quilts, add more pieces or purchase 108” fabric for your backing.